A fun short co-authored by Jonathan Harvey (Jissilly), author of Shades of Plaid. There aren't a lot of resources for a human who's running with the "undead"; No Facebook groups, no forums, not even a decent book of tips, until now. 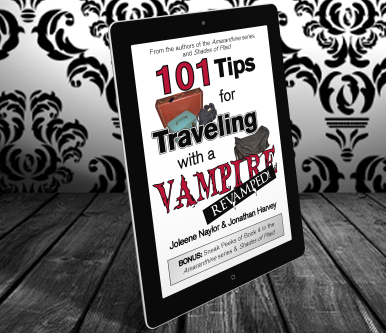 101 Tips for Traveling with a Vampire is just that, 101 tips for everything from boat travel to the classic American road trip. Sometimes funny, sometimes serious, these tips will prepare you for any travel that your vampire friend has in mind. Want more fang for your buck? The revamped 101 Tips for Traveling with a Vampire features a special bonus, "25 Tips for Dealing with a Vampire" and an exciting sneak peek at Heart of the Raven book 4 in the Amaranthine series. Also features a bonus sample of Jonathan Harvey's Shades of Plaid.